Koninginnedag is Queen’s Day, a national holiday in the Netherlands celebrating Queen Beatrix. The Dutch people gather together dressed in bright orange, to party in the streets, squares and even on boats in the canals. The problem is with all that alcohol intake, the guys are looking for somewhere close by to relieve themselves, and the canal conveniently fits that bill. 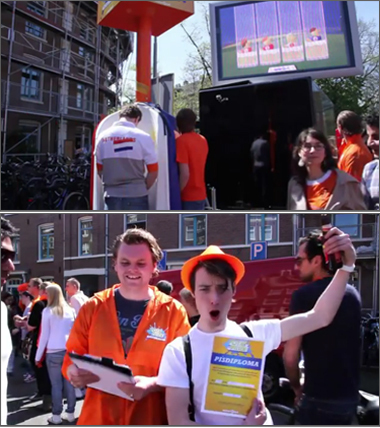 In an effort to keep the canals clean Dutch water supplier Waternet launched ‘Pot Je Pissen’ (Piss Off), a game that rewards those free-peeing gentlemen for using the proper facilities. The game was powered by flow detectors that were installed in each of the urinal stations, and a large digital screen displayed teh results. Whichever guy could pee the most would win the game and earn their water taxes back as a bonus. I can’t close this post without commenting on those plastic urinal station setups located just steps away from people passing by seem very public. I’ve never been to Amsterdam so maybe that’s the norm at these festivals, and anything is better than having guys pee in the alley and canals. I assume there’s more private facilities nearby for the ladies to use. 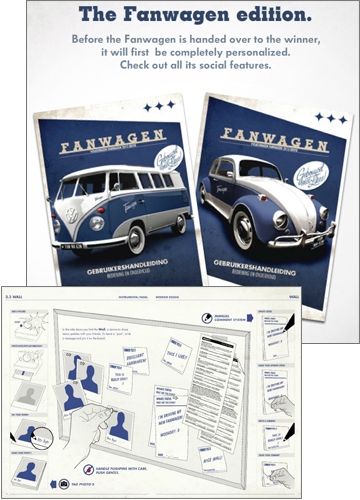 The ‘Pot Je Pissen’ campaign comes from the creative folk at Achtung! On November 17 at 9am, Dutch actress and presenter Froukje de Both will begin an 8-hour drive in a Citroën DS5, but she has no idea where she will be at the end of the day. Froukje and her co-driver will begin their day in the centrally located Dutch city of Amersfoort, but from that point on they will begin taking directions from their the Twitter followers of @CitroenNL. Let’s hope they don’t direct her into a nearby canal. The way that it works is that when the car approaches an intersection, they will choose the direction that has been tweeted the most. The goal for players is to get the car as close as possible to their location. At 5pm (local time) exactly the car will stop somewhere in the Netherlands. The first person who can find the Citroën DS5 and tweet the secret code found inside gets to drive the car for the next year. The whole event can be followed live throughout the day on the Citroën Netherlands Facebook page. Visitors can watch Froukje and her co-driver via a live cam inside the car and on see their location updated on Google Maps. 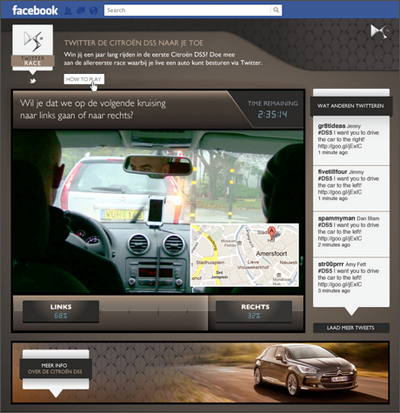 The Citroën DS5 Twitter Race was created by Euro RSCG Amsterdam and creative studio Perfect Fools. UPDATE: Nov 17 – The Twitter race ended at 5pm in the town of Soest, which is actually only 10 km from where it began this morning in Amersfoort. After hundreds of tweets (weirdly, none from the eventual winner) and hundreds of miles the car was claimed by Bart van Dishoeck (@DJBart1).